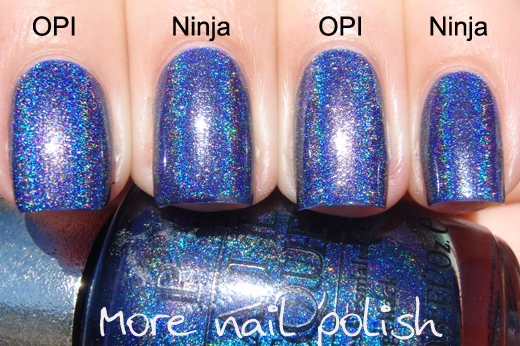 In my last Ninja Polish Haul, I was lucky to receive a few extra polishes to review. 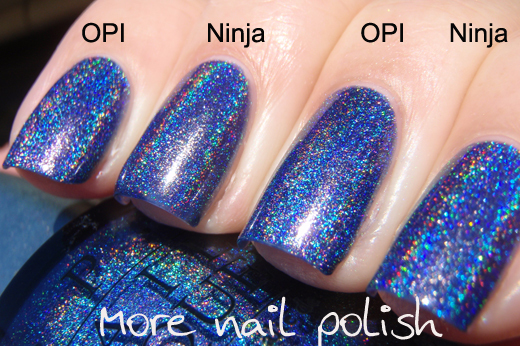 This is one of the ones I got - Ninja Polish Glamorous. In case your not quite the nail fanatic that I am and don't instantly notice which polish this is attempting to dupe, let me fill you in. 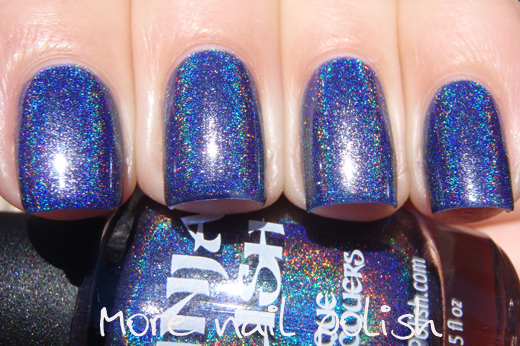 OPI DS Glamour is an old and discontinued puple leaning blue polish with a beautiful holographic finish. It is most sort after and difficult to find. If you do happen to find it you can expect to pay big bucks for it. I actually have two bottles, one I use and a backup. I could probably sell that backup for quite a sum, but I can't bear to part with it. 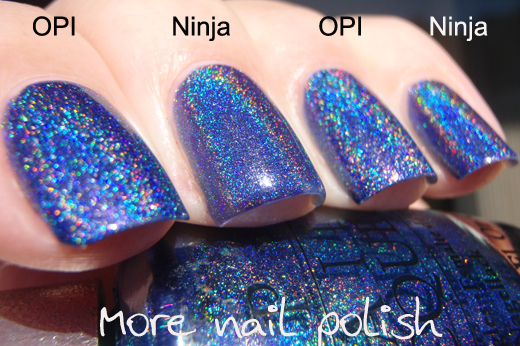 Ninja Polish Glamorous is touted to be a dupe. So shall we check it out? Here is Ninja Polish Glamorous. It has a great formula and is opaque in two coats. 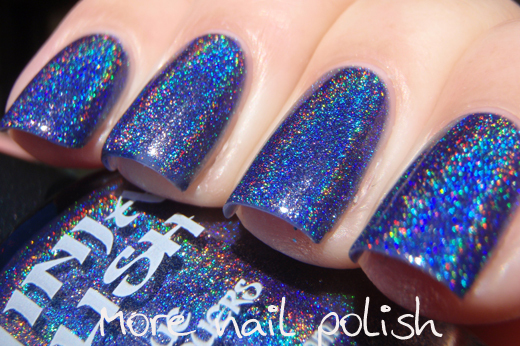 The holo effect is quite obvious but not totally in your face like the Color Club or Dance Legend holos. The base colour is a purple leaning blue and I would say this quite simply a stunning polish. OK so how does it really compare to OPI DS Glamorous. I've done comparisons indoors and in the sun. The sun ones can compare the holo flame and the indoor ones compare the colour and silvery speckled finish. I have personally tried to dupe this polish with tints and spectraflair, but I was never able to match the base colour correctly. I only really put in a half arsed effort, and tried twice, but that was enough wasted polish and spectraflair for me not to bother again. 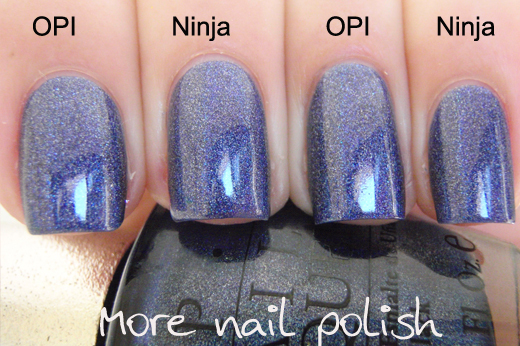 My verdict is that Ninja Polish Glamorous is an outstanding dupe for OPI DS Glamour. Even the bottle shape is basically identical. If they just put a silver cap on the top then it would be perfect :) The holo flame is pretty much identical and when viewing the polishes indoors, the base colour and finish is completely indistinguishable. They have done an amazing job recreating this classic polish so that more people can enjoy this discontinued beauty. 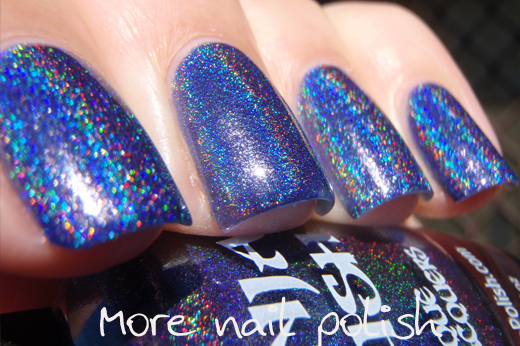 Wow, the color and holo effect are both amazing! Definitely going on my wishlist! Great post! I love Glamorous! Can't wait to receive my bottle ♥.